San Jose, USA - Every once in a while, we need to recharge our batteries by getting out and chasing after some biodiversity. One of the impressive stories of recovery efforts focusing on endangered species is the amazing work being done with California condors (Gymnogyps californianus). The Big Sur area along California's Pacific coastline is prime condor habitat, but the birds have plenty of places to keep away from the tourists. A little bit inland and less than 90 miles south of San Jose, California, is an excellent location for spotting these magnificent birds. Pinnacles National Monument is really a rockclimbing and geology playground, with tall spires and steep cliffs. Condors and all types of soaring birds seem to like the protection of the cliff faces and the abundance of thermals. The landscape is arid and almost stark. An excellent trail system, much of it constructed by the Civilian Conservation Corps in the 1930's, offers access to many parts of this federal protected area. But bring plenty of water and be prepared to work. The trails are excellent, but the climbs are significant -- "breathtaking" might be another word to use. On our first weekend visit to the area, we observed condors during hikes on both a Saturday and a Sunday. We also had a wonderful coyote choir serenading us Saturday night in the campground. On a subsequent visit, we failed to see any condors but we had a bobcat stroll past us while we were quietly eating supper. Small bats were zooming overhead to harvest the late-summer insect crop. Wild turkeys practically refused to get out of our way. 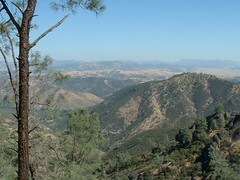 Pinnacles National Monument is only 26,000 acres, not a size that you would normally associate with a rich biota. Yet in addition to the condor mega-fauna, the Monument hosts more than 400 species of solitary bees. Size is important to biodiversity because smaller sites can only support smaller populations. If a population drops below a critical minimum threshold, it faces increased risks from external threats like accidents but also internal threats like a failure to find a mate or to breed successfully. Pinnacles is a release site for condors that have been hatched in captivity and raised for a return to the wild. This might account for ease with which we saw condors on our first visit -- they might have been youngsters who were still getting to know the area and its wind currents. None seemed to have the reddish neck and head so characteristic of adult condors. In other writing, related to nature-based tourism, I am frequently encouraging people to "think globally, travel locally" -- to help reduce greenhouse gases and other effects of long-distance travel. It certainly helps if you live somewhere with a serious protected area system already in place. Support your local protected areas! Get out there and chase down some biodiversity -- from an appropriate distance, of course.